Salmon is one of the most popular types of fish in the United States—and for good reason. It’s easy to prepare and can be used to make a variety of delicious dishes from breakfast to dinner. Salmon is typically served as a main dish, but it also makes for an excellent addition to soups, salads and appetizers. Perhaps one of the reasons behind salmon’s popularity is that it doesn’t have an overwhelming “fishy” taste. It’s also relatively low in calories and full of the protein, niacin, B12 and Omega-3 fatty acids that we need in our diets to stay healthy. So many salmon, so little time! There are quite a few different types of salmon and knowing the differences between the types can make grocery shopping much easier. First, you have to decide between wild-caught salmon and farm-raised salmon which is not only a decision based on taste preference but also on personal ethics. Wild salmon is caught in the Pacific ocean and because this type of salmon is caught in its natural habitat, it tends to be richer in both color and taste than its counterpart. Farm-raised salmon, also called Atlantic salmon, has a higher fat content because the fish are raised on a rich oil and grain diet. The higher fat content makes it harder to overcook—a tempting choice if you’re inexperienced in the kitchen. Wild-caught salmon is leaner and should be cooked medium rare; overcooking it will lead to very dry, almost inedible fish. You can buy fresh or frozen salmon, of course. Once you decide which type of salmon you’re after, there are even more choices to make. The most common salmon species include king (the most expensive), sockeye, coho, pink (the most common) and chum. And then you have to choose a salmon cut. Most recipes will call for salmon fillets, which is a parallel cut from the side of the fish, but you can also purchase salmon as a steak which is a perpendicular cut along the spine. Salmon is one of those out-of-the-fridge-and-into-the-oven dinners which is why it finds its way into our meal routine on the regular. However, depending on how you buy your fish, there are a few things you should keep in mind to prepare salmon. Most store-bought salmon will already have the pin bones removed, but occasionally a thin bone or two is left behind. If you’re concerned about pin bones, inspect your fish thoroughly prior to cooking. You can do this by flipping a bowl upside down and draping the fillet over it. This will help stretch out the fish so leftover bones will be exposed. You can remove them with a needle-nose pliers, tweezers or with your hands. If you purchased a frozen salmon fillet, allow it to thaw overnight in your refrigerator. You can bake frozen salmon, but you may accidentally overcook the outside while trying to cook the middle to the right doneness. If you don’t have time to let the frozen fish thaw overnight, you can run cold water over the salmon to thaw it or defrost it in the microwave. Salmon has great flavor on its own and needs very little to add additional flavor. You can start simple with a few drops of lemon juice sprinkled over top and a dash of salt and pepper, or you can try different seasonings to spice it up. The old stand-bys are fresh herbs like rosemary, thyme, dill or parsley, and you can use most anything from your stockpile of dried seasonings as well. Mixing those herbs with butter or olive oil works well. Lemon, ginger root, onions or soy sauce are also tasty choices. You can also marinate salmon to experiment with the flavor. Marination is simple; you mix together a few key ingredients, coat your salmon fillets in it and allow it to sit in the fridge for around 30 minutes. If you’re not sure where to start, check out these five DIY marinades that use ingredients you probably already have in your kitchen. This one-pan salmon recipe uses a chili-maple marinade using maple syrup, chili powder and soy sauce to make a spicy-sweet glaze. The best part? It only takes 10 minutes to marinate! You can cook salmon over the stove, in the oven or on the grill. We’re going to go through the steps of how to cook salmon in the oven; it’s one of the easiest ways to get dinner on the table because it requires very little ingredients, prep time, effort and dishes! Step 1: Preheat oven to 400ºF. Line pan with foil and spray with cooking spray. Step 2: Pat salmon dry with paper towel and place skin-side down in the foil-lined pan. Step 3: Pour butter over tops of fillets and season with salt and pepper to taste. Step 4: Bake the salmon for 10-15 minutes (start checking for doneness at 10 minutes), or until flesh flakes easily with a fork. Be careful to not overcook. Broiling salmon is another way to cook salmon in the oven instead of baking it. Unlike the process of baking salmon, whereby people swear by temperatures and times that vary from recipe to recipe, broilers are essentially the same temperature. 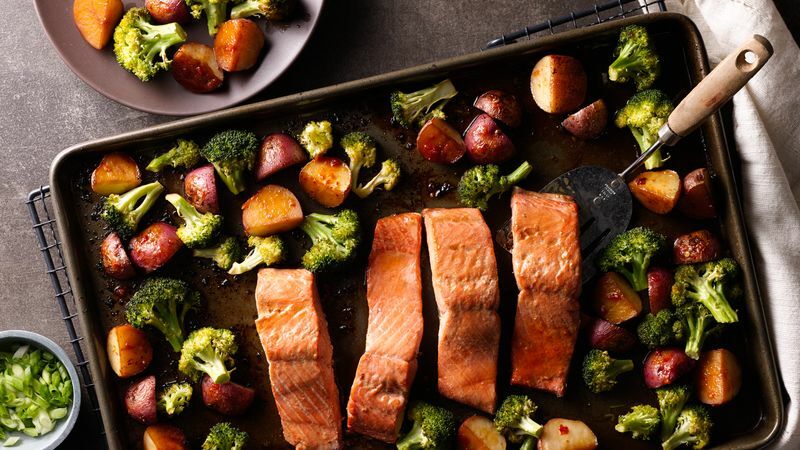 Baking salmon in the oven is quick and easy, but broiling salmon in either your oven or broiler is just as easy and the results are absolutely worth changing up your go-to salmon routine. One of the benefits of using the broiling method is that the exterior gets seared without drying out the interior of the fish. Use a broiling pan if you have one or line a cookie sheet with aluminum foil if you don’t. You should reposition the tray so that the salmon is approximately four to five inches from the heat. You should broil the fish for 10 minutes for every inch of thickness—although just like steaks, people have their preferences in terms of rare, medium rare and well done. If you’d like to broil a salmon steak that’s thinner than an inch, it will take between five and seven minutes. If the fillet is more than an inch and a half, you will need to turn it over and broil for an additional six minutes on the other side. If you’ve broiled the fillet correctly, it should be opaque in color, meaning it should be dull and not translucent. The flesh should be flaky when you test the thickest portion of the fillet with a fork or knife. Basic salmon is a breeze to make for a weeknight dinner but making salmon for a dinner party or special occasion is really simple, too. Make any one of these baked salmon recipes, add a side dish and dinner is done! This Asian-inspired sheet-pan supper gets a tasty, flavorful meal on the table in less than an hour. And cleanup is a snap with just one pan to clean! This oven-only one-pan dinner is delicious with baked salmon, but is irresistible with bacon and cream cheese-stuffed mushrooms. This roasted rendition of classic salmon gets a rich, crispy flavor and is a well-rounded meal thanks to potatoes and mushrooms. Wasabi adds a flavorful kick to baked salmon. It’s ready for the dinner table in 30 minutes. There are several methods to cooking salmon beyond using the oven or broiler. You can cook salmon with the grill or over the stove with a skillet. If you want to grill salmon, the process is a bit different, but still totally doable if you know how. It’s a bit more hands-on than cooking it in the oven; you should grill the salmon for three to four minutes per inch of thickness on each side with the grill lid closed. Medium-high heat is usually best. If this sounds easier said than done, we walk you through the entire process with our How to Grill Salmon article. Searing salmon in a skillet is a great way to cook the exterior of the fish without overdrying the inside. You can then finish the cooking process on the grill or in the oven. Try pan searing salmon with our five-star One-Pan Chili-Maple Salmon recipe. Looking for another easy way to make salmon? Here you go! Become a master chef in the kitchen with our easy-to-follow how-tos.